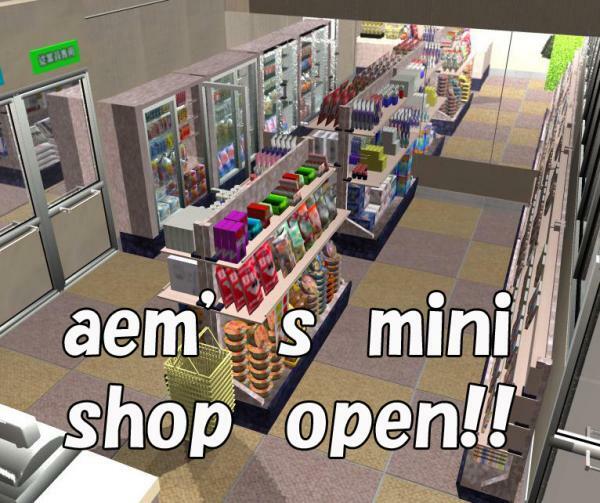 Plese real shoping (^^)/ in Tikanhonmati Aemi's Shop !! Pangurban (2 years ago) Inappropriate? Nero24 (2 years ago) Inappropriate? Excellent. Thank you! Come again. Robinson (4 years ago) Inappropriate? This store is awesome! TYVM! Thank you. This looks very nice. Wow. This will be very useful, thank you so much! What a generous gift - such a wonderful shop. Thank you! I didn't even know this was here and I have been looking for something like this for a long time. Thank you very, very much. It is very realistic looking. Excellent! I've needed one of these for quite some time. Now...on to look for a complete supermarket! Thanks ever so much for your kind gift. This looks awesome, thank you. Thank you so much. Been looking for a convenience store. Never thought there would be a free one. slowmurasama (6 years ago) Inappropriate? Thank you very much - it's great! FitzOmega (6 years ago) Inappropriate? This is really fabulous! Thank you! Extremely well done, and the fact that it's free and unrestricted use speaks volumes of your generosity. Thank you! frauenpower2010 (7 years ago) Inappropriate? Thank so much! That's just what I'm looking for my new webcomic. I'll give due credits. Daniyashka (8 years ago) Inappropriate? PilotHigh (9 years ago) Inappropriate? far more detailed than the one I made a few years ago! Amei, you are rapidly becoming one of my favorite modlers. Many thanks for this very realistic mini mart. This is a fabulous prob that many of us can really use again and again. Excellent !!!! Thank you very much !